University Archives is the repository for historical records of the University of Washington community. A wide range of primary source material relating to the administrative, academic, legal, fiscal, social and cultural interaction of individuals, departments and programs of the University since 1861 can be found here. Univerty Records - Records of the organization, functions, policies, decisions, procedures, operations, or other activities of the University. Faculty Papers - Papers of teaching and research faculty and professional staff that document the academic and administrative life of the University. University Publications - Materials written, compiled, or produced for distribution by offices, departments, or organizations that are a part of the University of Washington. Student Life & Alumni - Documentation that illuminates the daily activities and special events of students at the University of Washington as well as the alumni organization and its affiliate chapters. 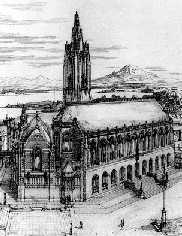 Perspective drawing for the Suzzallo Library. Special Collections, UW Libraries, Todd 652.